Hi Everyone! 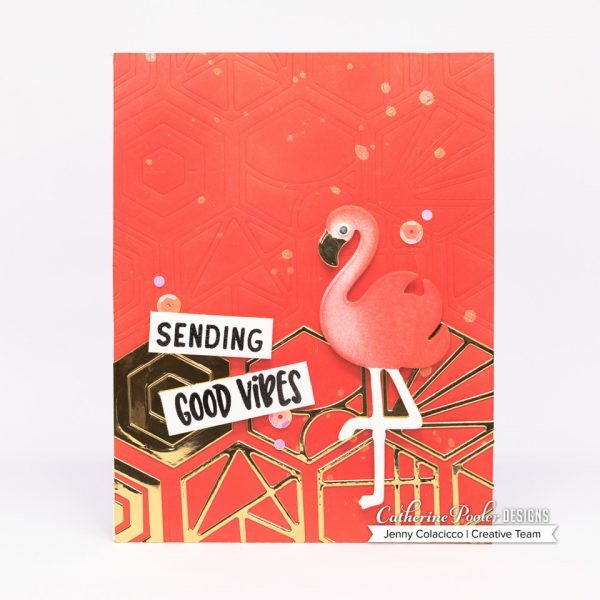 It's Jenny here, and I'm joining you today with a card I created using using the new Tropically Yours Stamp of Approval Collection. 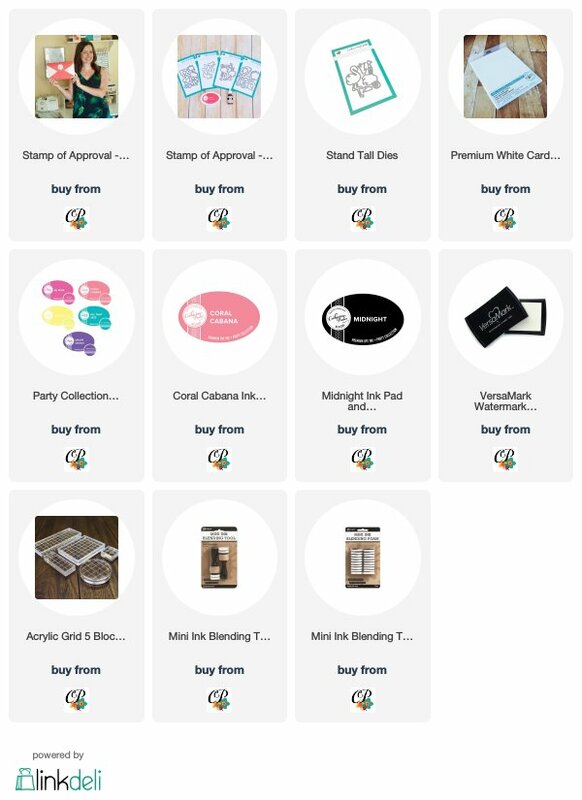 I don't know about you but this collection really gets me in the mood for a vacation (and a pina colada!) The new ink color – Coral Cabana – is absolutely gorgeous, I think it might just be my favorite of all of Catherine's inks, my photos don't do it justice – it seems to go with everything! For my card, I created my own custom Coral Cabana cardstock by swiping the ink pad over a white A2 panel. When the panel was dry, I took the new Cabana Tiles dies (swoon – I have used these in SO many ways) and dry embossed them into the Coral panel using my die cutting machine. This is much easier if you don't snip apart the tiles – they are already all lined up for you. I also die cut the tiles from gold mirror cardstock and adhered them directly over the bottom two rows of dry embossed tiles and snipped off any overhanging parts. I flicked on some gold shine mist and then adhered the entire panel to a white 110lb card base. I popped the flamingo up on foam tape on my main card panel. 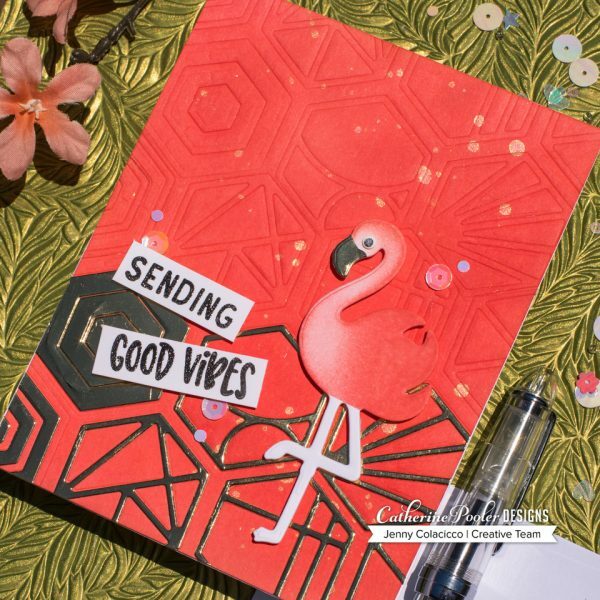 The sentiment is from the Good Vibes Borders stamp set, and was stamped in Midnight ink and heat embossed in clear embossing powder. I trimmed it out and adhered with foam tape at a jaunty angle. The eye for the flamingo was created with enamel drops by Ranger. I dropped a small amount of white onto the head of the flamingo and then a teeny drop of black into the center of the white. When dry, it looks like an eye. 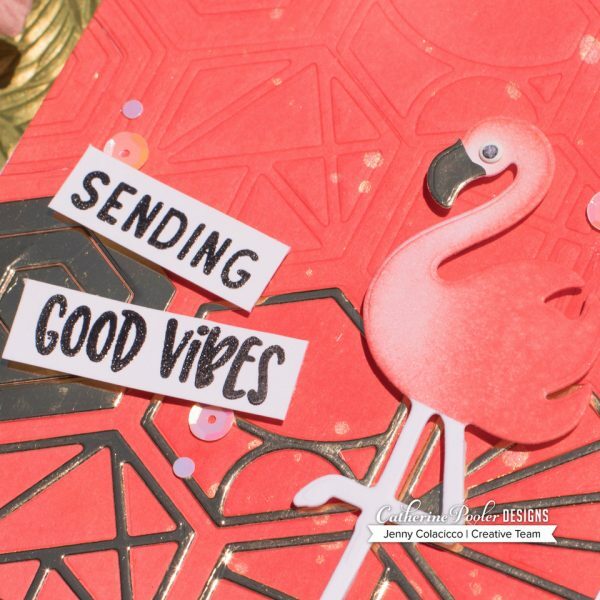 As a finishing touch, I found the Flamingo sequins mix by Little Things by Lucy which was a perfect match for this card! I hope you enjoyed this card and it brightened your day – if you have any questions just leave me a comment here.